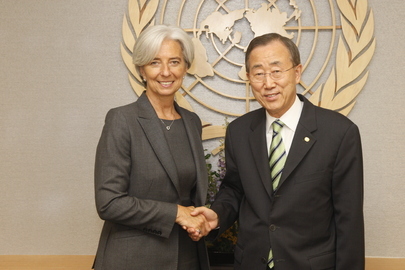 UNITED NATIONS, July 5 -- The disclosure by the International Monetary Fund of Christine Lagarde's terms of appointment for the next five years, on July 5 at 9 am, stand in contrast to those of Ban Ki-moon as Secretary-General of the UN. First, that Lagarde is getting a full five years represents another loss for the developing world countries which pushed for a non-European to replace Dominique Strauss-Kahn. When it became clear that Lagarde would beat out Mexico's Carstens, some predicted that there would be an understanding that the next Managing Director would be from the developing world, and in less that five years. The latter, the letter of appointment indicates, is not the case. But the IMF letter of appointment contains restrictions on conflicts of interest, receiving honors and even travel pay which the UN either doesn't have for Ban, or does not disclosure. At the IMF, waiver would be need by the Executive Board. At the UN, while the selection of the S-G is ostensibly by the General Assembly, they provide little to no oversight thereafter. Waivers are gotten through the Ethics Officer, who is selected by Ban: a conflict. It's worth noting that the one slightly more independent overseer of the S-G, the Under Secretary General of the Office of Internal Oversight Services, had an occupant, Inga-Britt Ahlenius, who was sharply critical of Ban when she left. Her successor, selected by Ban, has said little on the topic. By contrast, how much the UN pays for the travel of Ban, his family and entourage is entirely opaque. When Inner City Press even asked about what happens with the airline travel miles of Ban, who speaks about the environment, no answer was provided. The IMF emailed to accredited media an embargoed copy of Lagarde's appointment letter. The UN won't provide details about Ban's terms of service even when directly asked as its noon briefing. The IMF Executive Board hold an annual “performance feedback process” with the Managing Director. Ban proceeds for five years with little to no oversight. 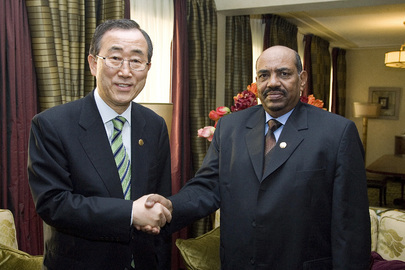 At the UN, there appears to be no mechanism at all for removal.